Wooden Toy Pirate Ship Playset has everything you need for an adventure on the high seas. 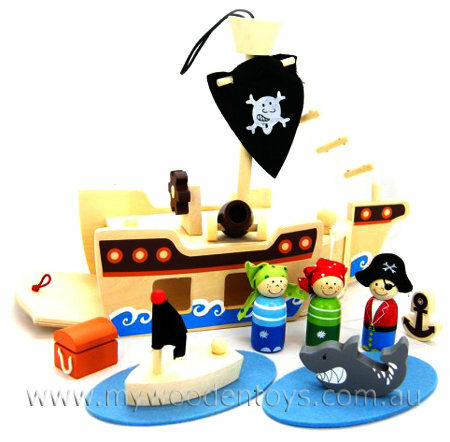 This beautiful wooden playset comes with three wooden pirates complete with material head scarves. A cannon, treasure chest, little row boat, a menacing shark and two blue felt oval pads to create 2 pools of water. There is also a triangular sail with a smiling skull and crossbones. The stern of the boat opens up so you can store things inside... including prisoners. Size: 32cm long x 42cm high x 13cm wide. The little pirates stand 7cm high. Material:Wood, Child-safe paint, cotton, felt, elastic. We like this because: "So much here to play with. A beautiful set."